Enbridge Partners announced it has reached an agreement with Marathon Petroleum to become an anchor shipper on the Sandpiper Pipeline. The Sandpiper Pipeline is a 225,000 b/d oil pipeline that will run 375 miles from Beaver Lodge, North Dakota, to Clearbrook, Minnesota. The project also includes a 30-inch, 233-mile pipeline extension from Clearbrook, Minnesota, to Superior, Wisconsin. 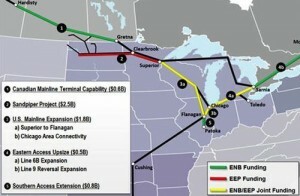 Marathon will fund 37.5% of the pipeline and gain a 27% interest in Enbridge's North Dakota System. The project has an estimated cost of $2.6 billion and is expected in service in the first quarter of 2016. An open season for the pipeline starts at 12 pm MST on November 26, 2013 and ends at 5 pm on January 24, 2014.